Save on the items you need to get the cleaning job done faster! So, you're still wondering how to get a power washing edge on your competitors? After getting a powerful pressure washer, invest wisely in accessories. 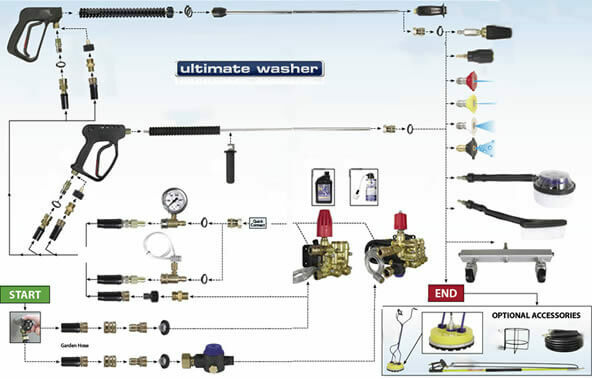 Ultimate Washer offers a full line of name brand equipment at discount prices, 24/7 friendly knowledgeable customer service representatives, after hours and weekend E-mail tech support, factory tech support and a wide variety of accessories and attachments to choose from. For commercial or residential use, we have the right equipment for you. Click on this chart to find parts and accessories you're looking for! Teflon Tape is the inexpensive and effective material used to seal pipe threads being joined together for plumbing purposes. It is used to seal water on pressure washers fittings and prevent from leaking through threaded connections. Technically known as PTFE (polytetrafluoroethylene). Install on outlet of the pump to measure system performance. They attach quickly and easily to pressure washer outlet. 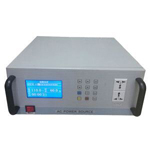 Features include maximum and minimum pointer, stationary set hand, chemical seal and metal pushrod. Ball valve allows the user to temporarily stop the water flow through the pressure hose (without shutting down the machine) and change quickly between spray gun and other attachments such as flat surface cleaners, extension wands, and water brooms. You will find here all the connectors you need! Level action piston pump with quick fitting harness. Adjustable Pressure 55 PSI. This unit will has a capacity of 2 Gallons and comes with 2 nozzles. Get wheel assemblies for your pressure washers. We have ball bearing, foam filled tires (to avoid flat tire) and nylon bushing standards. GFCI's protect people and equipment by interrupting potentially lethal ground circuits exceeding 6mA. The dangers of electrical shocks have been long known - GFCI's are the only real way to be safe. Most city & county codes now require GFCI protection on power cleaning equipment. Consumers should not use "adapter plugs" to connect the three-wire plug to a two-prong household receptacle without properly grounding the adapter plug. Learn more about ground fault current interrupters. Duct Cleaners are specially designed to clean Ducts, Trash-Chutes, Vents, Restaurant Hoods, Tanks and more. 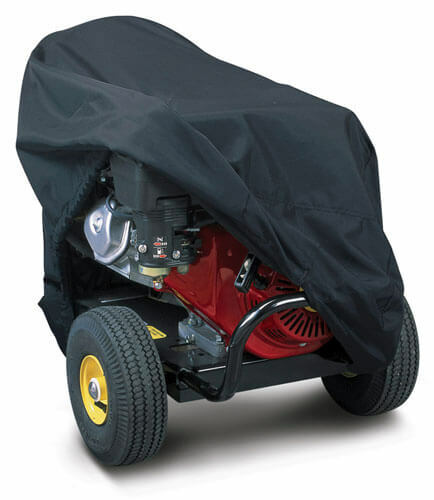 This is the perfect accessory for any hot or cold pressure washer. Protects pressure washers against rust, dust and sun damage. Keeps dirt, debris and weather out of the motor.